Here it is, on its own: the second round of the square motif from the previous post. The centre is surprisingly small, isn't it? It wouldn't need much at all to be added. And I think I could make this into a one-pass motif, which would be even better! I love the diamond shape that emerges within the square one and I think if I moved the join of the small rings, it would alter this lovely shape. On the other hand, I might trying joining the picots on the chains below the trefoils as they touch anyway and look a bit superfluous like that. I really like this. I might tat a few to put together... if I don't get distracted by something else! 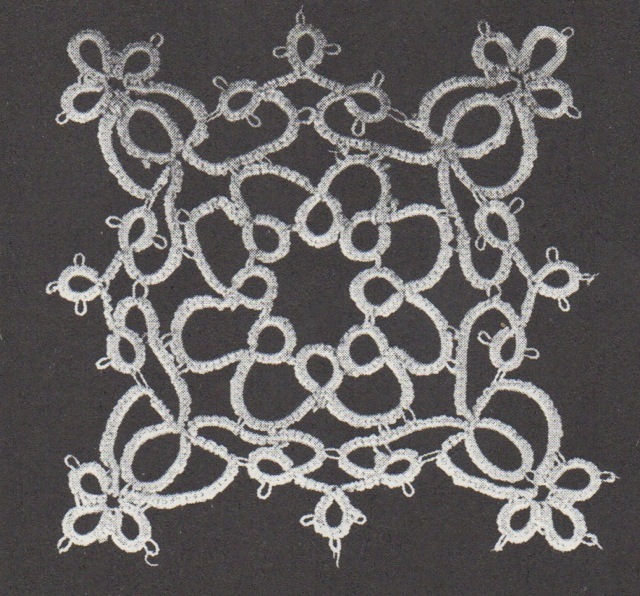 Oh, nearly forgot: here is a scan of the photo of this motif as it is shown in Anne Orr's book. So yes, the two motifs "fit" together but look at those chains... I don't like to be too critical... but they're a bit like spaghetti, aren't they?! And see how the outer chain of the trefoil is pulled out of shape as well by being attached to the small rings? 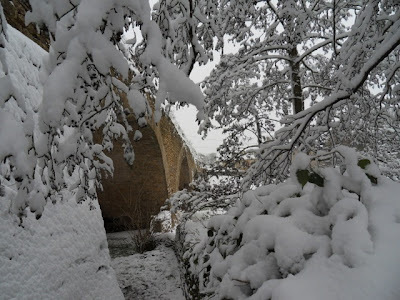 And we finally had snow for the first time this winter! All schools were closed today and not many people went to work. 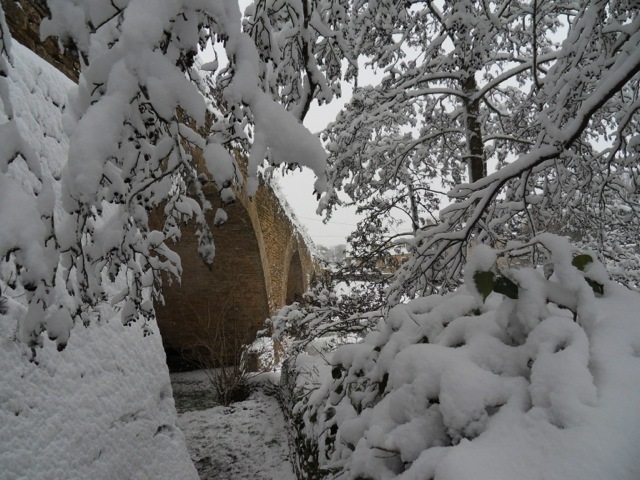 It feels so peaceful with all that lovely soft snow all around. I went sledging with the family. Wonderful. I wonder if it was intended to be made with a smaller thread? And that's why it doesn't end up the way the pattern says it should? I don't think so Kelly, because it's how the two motifs relate to each other that doesn't work and that would change with the size thread. I really think the answer is in how the motif in the book looks: the chains are not pulled snug like we do it nowadays. In which Anne Orr book can the original pattern be found? 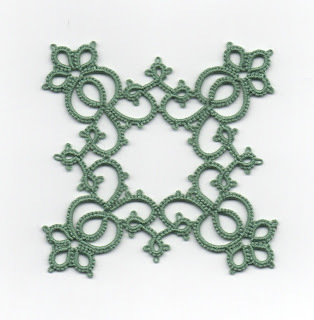 It's in Anne Orr's Classic Tatting Pattern (published by Dover Needlework Series). I am glad he flew away. Mine was gone a few days ago. I think they distract from content. Your motif is much nicer. The corners are reminiscent of the quatrain pattern. I think I would also move the small ring's join point up a few stitches. You must have so much more patience than I do to be willing to tweak the "old stuff"! Hi Susie, I might just have to give that a try now you've said so too. What I find even more frustrating that tweaking the stitch count with old patterns, is actually reading them! It's just lines and lines of text to decipher. Today's patterns are so much easier to read, aren't they? Might a 'doodad' be an option for the center of this lovely square? Long time lurker popping in to say just how impressed I am with your version of the pattern? I'm a novice tatter and even *I* can see just how sloppy the vintage version looks. Yours is clean, tight, and elegant. Good work! So elegant! Do you need to have anything in the middle at all? I like the open space and it's not too big. Yes, that's the answer to why the stitch count doesn't work now, your chains are much firmer and neater than the original. I'm glad you said that Jane because I was debating myself whether I could leave that space empty. Just still not sure if it's a tad too big... but maybe not. Maybe just a few extra decorative picots would be enough. I'll have to try it. PS, yes, the butterfly was a bit distracting. I sometimes had to 'wiggle' it to get it to work. Oh good, then I'm glad I decided to get rid of it! People were too nice and not saying it was bothering them. Your version looks much much better than the original. Your motif has that elegance. It is amazing to see the original picture and compare it to your tatted piece, yours is so much better. No center piece needed. Can I second the thought that it doesn't need anything in the centre? It's such a lovely collection of shapes as it is... Also, it doesn't look like it needs it structurally either. It's a beautiful patterns it is. And yes, the original is a bit of a shock... Not the most appealing piece I've ever seen! Interesting that the secondary shape which is a diamond in your version is much more circular in hers. Thanks Occasionalcrafter - it's always nice to hear people's opinions. Yours is another vote for leaving the centre... so I think I will. And yes, interesting how that diamond shape is non-existent in the original. I think Anne Orr would be honored to see how beautifully you tatted her pattern. Your attention to detail and to tidy, even stitches makes it shine! It's lovely without the center round, though with one appropriately sized, it would be pretty with one too. It probably depends on what you plan to do with it... A whole dresser scarf made of this motif would have an entirely different look depending on whether it had centers or not. Very elegant, much better then the original. you have a good eye, to see the potential in the original. Joining the picots below the tre-foils, would add to the stability of the motif. I can't tell from your picture how large the center area is, but it might not need anything once you do join them. Another other possibility is to add small rings where the other picots are in the center, you could join them below the diamonds. creating another interesting negative space. I can certainly see the option of doing this in one pass. Thank you Ladytats. I did try joining the picots below the trefoils and don't like the look - the shape is not so appealing. I also started making little rings towards the centre but didn't complete it yet so I can't show you what it would look like. I will get back to it. interesting, would moving the join closer to the trefoils change the out of shape pull, yet allow for the stability of a join? Quick reply Ladytats! Yes, it might. Something to consider. Though the motif is quite stable as it is... I could perhaps even just removed that picot. I will try different options. This turned out perfect without the center Ü Much much better than the old picture of the original with everything out of shape...., I think the negative space in the center really highlights the form of the piece. I wouldn't change a thing. Your work is always so lovely, and I absolutely adore this particular pattern. 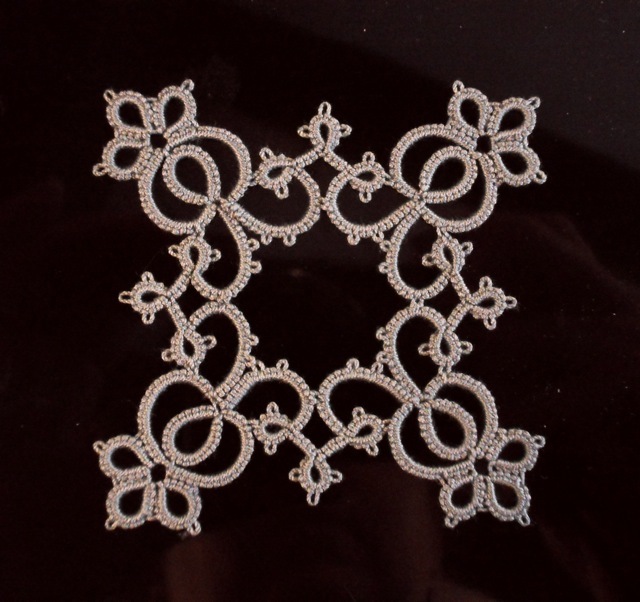 Do you do FS/BS tatting? Is that why yours always looks so very perfect? I've just never seen anyone's tatting that is as flawlessly perfect or as visually appealing as yours. Thank you so much for your lovely comment (it came in while I was away, sorry for being slow in replying!). 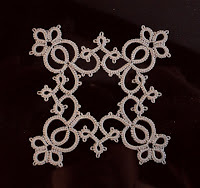 I only occasionally use FS/BS tatting and I haven't on this particular motif. We've had many discussions on the merits of FS/BS tatting vs traditional tatting and although I still like to use it occasionally, in general, I tat traditionally and that's how I'm happiest. I find I "lose my flow" when I FS/BS tat and prefer the rhythm of traditional tatting. You reminded me that I don't think I took notes on the modifications for this pattern, so I might get it out now and re-study it. I really appeals to me too. 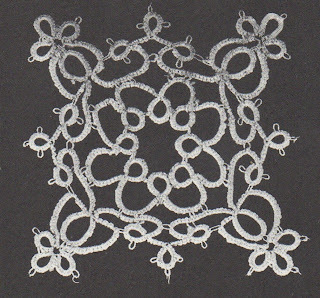 More Jan Stawasz... a doily?